Yuvraj Singh is the first and only player to hit 6 sixes in a over in a T20 match. This article gives you complete information about Yuvraj Singh. This article includes biography and profile of Yuvraj Singh. More details about career performance of Yuvraj Singh is also quoted in this article. 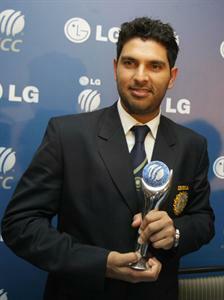 Yuvraj Singh was born in a Sikh family in the year 1981 December 12 at Chandigarh, India. Yuvraj Singh's father Yograj Singh is also played cricket for India as a fast bowler. Yuvraj Singh started his one day career in the year 2000 October 3 against Kenya and test debut in 2003 October 16 against New Zealand. Currently Yuvraj Singh is signed for Pune warriors IPL team. Yuvi also played for Punjab, Yorkshire and Kings x1 Punjab. The most memorable performance of Yuvraj Singh is the 6 sixes in a over in a T20 match which is the world record in International cricket against Stuart Broad of England. Yuvraj Singh is a left-handed batsman and a slow left arm bowler. His match winning innings against England in Natwest series final is also unforgettable for the cricket fans. Yuvraj scored his first century against Bangladesh in 2003. Yuvraj Singh had a great year in 2006 where he was awarded three Man of the series award in different tournaments against South Africa, Pakistan and England where he scored a total of 3 centuries and 4 half centuries and this consistent performance of Yuvraj Singh made his rankings in top 10. In 2008 Yuvi scored 138 runs from 78 balls against New Zealand. Yuvraj Singh showed his real talent and brilliance in 2011 ICC World cup and his all round performance lead India to take 2011 ICC world cup. He won 4 man of the match award and the Man of the series award in 2011 ICC world Cup. Yuvi had taken 15 wickets and 362 runs in the 2011 world cup. Yuvraj Singh started his test match against New Zealand in Mohali, Punjab that is his hometown. In 2004 Yuvi scored his first test century against Pakistan. His second century was also against Pakistan in 2005. Yuvraj Singh scored 169 runs against Pakistan in 2007, which is his highest score in test matches.